Peter Lovis, owner of the Concord Cheese Shop, has inspired a town celebration based on the arrival of crucolo cheese to the store. Most winter weekday afternoons in Concord are a quiet affair. 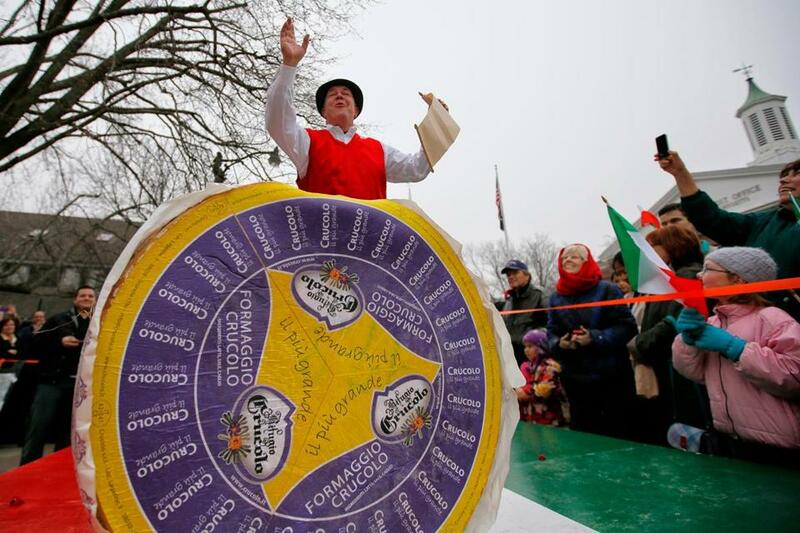 But if you happen to visit Concord on Dec. 1 at 3:30 p.m., expect to see something unusual: crowds of people waving red, white, and green Italian flags and cheering for the arrival of a gigantic wheel of cheese. This isn’t just any fromage, of course. It’s Crucolo, an artisanal cheese from Northern Italy. The enormous wheel of it reportedly weighs 400 pounds. And in less than a decade, the celebration that accompanies its entry into Concord has bloomed from a tiny, commercial event into an unlikely town-rallying ritual. How did this makeshift holiday come to be? It all started at the Concord Cheese Shop, a quaint little establishment on Walden Street. The shop sells wine, sandwiches, and (of course) a wide variety of cheeses — 150 to 200 varieties at any given time, from the Welsh Gorwydd Caerphilly to the relatively local Bound for Glory, a clothbound cheddar from Jasper Hill Farm in Greensboro, Vt.
December is prime time for cheese shopping, and one type of cheese in particular — Crucolo — proved to be very popular among customers in Concord. 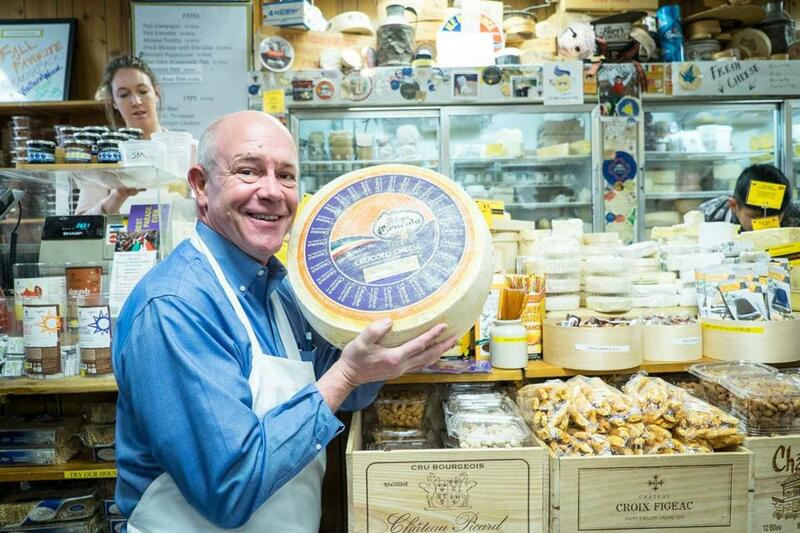 A mild asiago fresco made from cow’s milk and imported from Italy, it always sold out quickly, said Peter Lovis, the gregarious owner of the Concord Cheese Shop. So when Lovis heard that the company made larger wheels of the stuff, he decided to buy big. Really big. When the first giant wheel of Crucolo was delivered in 2010, Lovis marked the occasion by hosting a little celebration at the store. The cheesemongers went to work halving and quartering and cutting up the cheese, and piled the pieces up on the counter. The stack grew so tall that people started coming up to Lovis and asking him, “Can I get my picture taken with the cheese?” Lovis, naturally, obliged. Lovis during the 2013 cheese parade. The next year Lovis bought a longer red carpet. And when the audience outside got so thick that spectators had a hard time viewing the cheese, Lovis decided to display the cheese on an elevated platform. The event grew from there, with the addition of balloons, Italian singers, and a horse-drawn wagon to carry the cheese. “It just kept getting bigger and bigger,” Lovis said. By 2013, hundreds of people were coming out for what had become an annual tradition. Last year, up to 1,500 people attended. It even drew protesters. Last year, a group of vegans gathered to object to the cheese parade. Eight protesters held signs with slogans like “Cows’ milk is meant for calves,” and “It can take 1,000 gallons of water to make 1 lb. of cheese,” and “Got climate change? Rethink dairy.” One protester was dressed in a cow costume. “You know you made it if they protest your cheese parade,” said Lovis, with a chuckle. Lovis notes that the Crucolo comes from Scurelle, a tiny hilltown in northern Italy where they’ve been making cheese for hundreds of years. The milk, according to the importing company, comes from cows that roam scenic pastures near mountains. “This isn’t industrial farming,” Lovis said. Lovis says the celebration has been a boon to the local economy, as people have traveled from as far as Chicago and New York to take part in the festivities. On Thursday, a team of draft horses will turn the corner of Main Street onto Walden Street while hauling the cheese on a wagon. They’ll be accompanied by a band from Concord-Carlisle High School, a dance troupe from Concord Academy, uniformed militiamen, and Miss Crucolo USA, Miss Crucolo Universe, and Little Miss Crucolo. The wheel of cheese will be rolled off the cart and halved and quartered on a raised stage, and then samples will be passed around to the spectators. Afterward, the Crucolo will be sold at the shop by the pound. It typically sells out in less than 14 days. For the cheese shop, it’s all the more reason to celebrate. “There’s nothing like a cheese parade,” Lovis said. The 7th annual Crucolo Cheese Parade will take place at 3:30 p.m. on Thursday, Dec. 1, at the intersection of Main and Walden streets in Concord.